eFilmCritic - The Worst Films of 2006: Better Late Than Never. The Worst Films of 2006: Better Late Than Never. An admittedly late look at the worst films of 2006, a bumper crop so abundant that it wasn't even necessary to include the likes of "Date Movie" or "Bloodrayne." I have always felt that year-end lists are a lot like Christmas decorations�they are an amusing addition to the holidays but if you haven�t gotten them done and out by Twelfth Night, you run the risk of looking like a spectacular rube. Therefore, I apologize in advance for the incredible tardiness of this particular piece. In my defense, all I can offer is that after having sat through a series of films as spectacularly and excruciatingly awful as these, I think I deserve to be cut a little bit of slack. Anyway, here are the Ten Worst Films of 2006 and remember, I saw them so that you didn�t have to. 1. AMERICAN DREAMZ (directed by Paul Weitz): The idea of a film simultaneously skewering craven �American Idol� contestants, the equally craven policies of George W. Bush and his cronies and a zombified American populace that is far more concerned with the former than the latter sounded like a great idea�especially in the hands of Weitz, who demonstrated a flair for subtle social satire with �About a Boy� and �In Good Company��but was executed in such a flat-footed manner that even the few bright spots (some funny and self-mocking moments from Mandy Moore as one of the pop-star wannabes and a couple of dead-on song parodies) were lost in a sea of incomprehensible story-telling and the kind of ham-fisted jokes that wouldn�t pass muster on �MAD TV.� This was so bad that even the usually reliable cinematographer Robert Elswit turned in work so substandard that it made an already dreadful film into something that was literally unwatchable. 2. 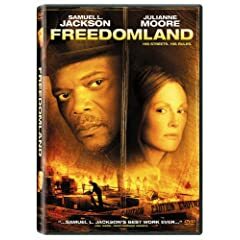 FREEDOMLAND (directed by Joe Roth): How can you possibly screw up a film with actors as talented as Samuel L. Jackson and Julianne Moore and a screenplay that the great Richard Price adapted from his own acclaimed 1998 novel about a detective trying to keep the racial tensions in a black New Jersey neighborhood from boiling over when a white woman claims that a carjacker has made off with her infant son? Easy�you give it to the hack behind such formulaic crap as �America�s Sweethearts� and �Christmas With the Kranks� and let him hammer it into the ground with a mannered style that is meant to evoke the likes of Martin Scorsese or Spike Lee but which comes off more as sub-Rob Weiss instead. 3. THE LAST KISS (directed by Tony Goldwyn): As smug and stupid as the Italian comedy-drama �L�Ultimo Bacio� was, it comes off as a modern-day �Annie Hall� when compared to this aggravating remake that tries to transform the basic premise of the original (a shmucky guy entering his 30's responds to the delayed arrival of adulthood, courtesy of the unexpected pregnancy of his longtime girlfriend, running into the arms of the college-age cutie who is improbably attracted to him) into a clone of �Garden State,� complete with star/soundtrack compiler Zach Braff. The problem isn�t that the main character is a self-absorbed jerk who is nowhere as deep or soulful as he thinks he is�the problem is that he is an annoying and uninteresting self-absorbed jerk who is nowhere as deep or soulful as Braff, Goldwyn or screenwriter Paul Haggis think he is. 5. RUNNING WITH SCISSORS (directed by Ryan Murphy): Speaking of �Mommie Dearest,� that true-life expose of a monstrous mother was a model of restraint and subtlety when compared to this disastrous adaptation of the best-selling Augusten Burroughs memoir. In bringing the story to the screen, Murphy tries to convey a tone that simultaneously blends despair and humor but instead comes up with a pastiche that more closely suggests what �The Royal Tennenbaums� might have been like in the hands of the �Pink Flamingos�-era John Waters (without the wit) while thoroughly wasting a fine cast (including Annette Bening, Brian Cox, Jill Clayburgh, Evan Rachel Wood and Gwyneth Paltrow) on material far beneath them. 7. 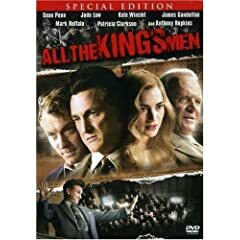 ALL THE KING�S MEN (directed by Steve Zaillian): Of all the remakes to come out in 2006, this new version of the Robert Penn Warren political novel, loosely based on the rise of Huey Long, probably had the most promise since the 1949 original, though lauded in its day, is one of those �classic� films that simply hasn�t aged very well over the years. And yet, it comes off like a rose compared to this version, which plays like a Cliff�s Notes rendition of the story (without the narrative flair) and features a powerhouse cast delivering performances that range from wildly overscaled (Sean Penn) to thoroughly undernourished (Jude Law) to frankly inexplicable (Anthony Hopkins). Zaillian may have been going for Oscar gold here but all he accomplishes is the dubious achievement of being the first director to get a bad performance from the usually reliable Kate Winslet. 8. THE HOLIDAY (directed by Nancy Meyers): Apparently not content to be in only one of the worst movies of the year, Winslet and Law jumped on board for this witless and overlong gob of romantic comedy goo about a pair of lovelorn women (Winslet and Cameron Diaz) who switch houses for the holidays and find romance with a pair of quirky suitors (Law and a completely defanged Jack Black). Aside from the criminal waste of Winslet (who managed to save some face by turning in the performance of the year in �Little Children�), the most annoying thing about this film is that Meyers, whose �Something�s Gotta Give� demonstrated traces of wit that are nowhere to be seen here, clearly thinks that she is being clever in making a romantic comedy that is aware of the conventions of romantic comedies even though the result is just as smarmy and cliched as the films she is commenting on. 9. MY SUPER EX-GIRLFRIEND (directed by Ivan Reitman): Although I know I saw films much worse than this one, I am including this one on the list because it takes what should have been a slam-dunk idea�ordinary dope Luke Wilson finds himself on the bad side of neurotic super-heroine Uma Thurman after he breaks up with her�and transforms it into an ugly, unfunny and incredibly misogynistic mess that not even the sight of Thurman in her super-outfit can quite overcome. And yet, this was one of the many films that Fox decided to give a proper release to in 2006 while allowing a genuinely hilarious work like �Idiocracy� to languish. 10. 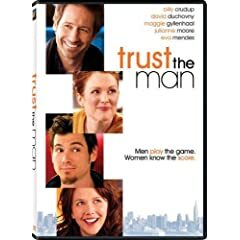 TRUST THE MAN (directed by Bart Freundlich): Normally, I wouldn�t waste a space on this list for a little-known independent movie that the majority of those reading this have never even heard of, let alone seen. However, this abysmal comedy-drama about the romantic misadventures of a pair of oafish Manhattan couples (played in what may be career-worst performances by David Duchovny, Julianne Moore, Billy Crudup and Maggie Gyllenhaal) was so off-putting�it wants to evoke the spirit of Woody Allen but comes off more like a lesser Henry Jaglom effort�that I couldn�t resist including it as a reminder that quirky indies can be just as unendurable as their big-budget brethren.